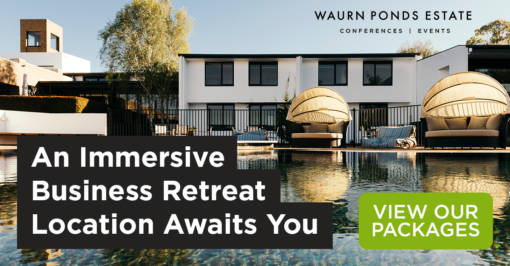 You may not know this, but as well as being one of Victoria’s most unique conference venues, Waurn Ponds Estate is also available for short-term corporate accommodation bookings from Monday to Friday. Here are 3 reasons why you should consider us for your next corporate overnight stay or a short-term business trip to the Geelong region. Both room types feature a king size bed which can be split into two king single beds on request, a luxurious bathroom, desk, tea and coffee making facilities with either pool, garden or Estate views. The Standard Room Plus is slightly larger than the Standard Room. With only two suites, both located in the far corner of the property, they offer stunning views, kitchenettes, double bathrooms and spacious lounge rooms to work or relax. The ground level suite offers a queen size bed and opens out onto a large terrace area overlooking the Estate’s lakes. The first level suite offers a king size bed and breathtaking views of the Estate’s lakes, from both the bedroom and lounge area which are partially separated. Click here to learn more about our accommodation options. Beautiful and expansive indoor lounge area. Our 8 meeting rooms are of the most premium standard, with state of art audio visual equipment and Wi-Fi. Meeting rooms will need to be booked ahead of time to ensure that there is one available for your use during your business stay. Click here to learn more about our corporate spaces. The Estate is situated on Deakin University’s Waurn Ponds Campus making it the perfect place to stay if you have business at Deakin or Epworth Hospital, which is located right next door to the campus. Located just off the Princes Freeway, the Estate is perfectly located for ease of access to the Geelong CBD in under 20 minutes. If you’re travelling to Geelong for business from Melbourne or by plane then our location is extremely convenient as it has almost direct access to the Geelong bypass. Travelling on the bypass cuts travel time to Melbourne down to under 60 minutes and only 30 minutes to Avalon airport. If you would like to make a booking enquiry for corporate accommodation please visit our contact page and fill in the form. Alternatively, you can call us on 03 5227 3000 during business hours to discuss your requirements.